Wow so much got achieved this year on my last trip, it really has been an action packed time. I really lucked out with stopping off en route to Costa Rica. For so many years I have wanted to visit this country dedicated to National Parks and no military. I could not bring myself to fly there just for a holiday. However, as the flight to Ecuador stopped there I arranged to get out!! Many years ago I made a fund-raising documentary 'Amazanga Kausai' for The Osa Foundation to help build up money to buy back some ancestral land to return it to the indigenous people who live there. An incredibly biodiverse area surrounding the volcano Mt Sangay. Due to 'development' (logging, cattle ranching, palm oil, gold and copper) they are losing their land and were concerned for future of their children. With the help of the film the foundation were able to raise $30,000 and return the land to the rightful owners. I was then invited by the foundation to visit Guaria de Osa, their paradise lodge in Costa Rica which is working to protect endangered turtles. Owing to people collecting the eggs to eat, the turtles have become threatened. Guaria de Osa have set up a voluntary programme to survey the beach every night and dig up and move the eggs to a protected area. 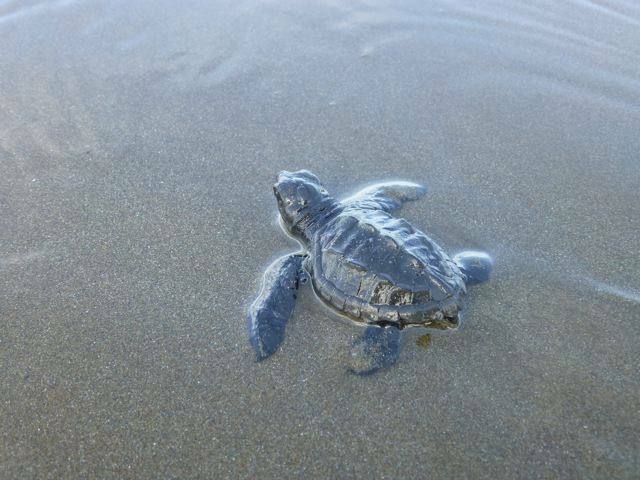 When the time comes and the baby turtles surface they are then moved to the beach and released for their long journey. It is incredible how far they travel and to think that from four years old they return every year to the same beach where they were born. Only one in every 1,000 turtles survive to adulthood. I was blessed enough to be there at the right time to help release these cute baby green turtles ready for their long adventure. Seeing the millions of small pieces of plastic rubbish on the beach I started to fill empty plastic bottles. The volunteers seemed keen to build an environmental centre as it highlights one of the threats to the turtles who mistakenly eat the plastic. Back in the capital of Costa Rica, San Jose one of the coordinators of the Peace Centre heard I was coming and invited me to show 'Blood of the Amazon' followed by a Q and A. It was then I found out that the Ecuadorian Government have a full write-up about the film in Spanish on their Yasuni ITT website. I also spoke to the Department of Environment about the new proposed law of Ecocide. A great stop off and a recharge on my way to Ecuador. As always I had taken on a huge amount of work and ended up flat out for almost the entire duration of my trip. It makes me laugh when people think I have gone on holiday. 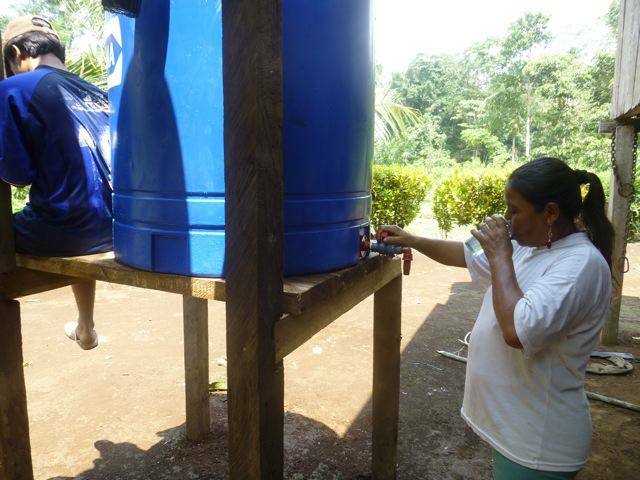 I managed to build a record number of rainwater systems for 23 families currently drinking highly contaminated water. 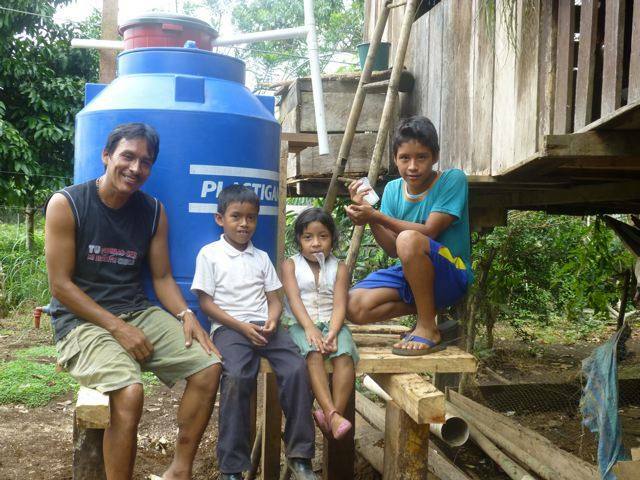 I stayed out in one Shuar village outside Shushufindi to build seven of the systems. They are surrounded by over 50 oil wells and their only access to water is one well in the village which everyone shares. When they told me that the bridge was down 2km from the village and we would have to carry everything in, the look on my face obviously gave the game away. It was a lot to carry but the whole village helped and everyone assisted at each other's house. One of the highlights of staying in the village meant it rained whilst I was there and I was able to see the people actually drink the water. The grandmother's face lit up as she expressed "Wow, it doesn’t taste of anything, quick come and try it..."
I have a different way of working in the communities to most organisations and believe it vital that the families are a part of the project. They must provide the wood for the platforms and I bring in the tanks, gutters, down pipes, fixtures and fittings and filters (large dustbins containing fine stone, charcoal and quartz sand). Working together means the people are a part of the system and value it more. They then must take responsibility to put a roof on to protect the tank and wood, keep it clean and add more charcoal. I buy all the materials in local hardware shops which distributes the wealth locally rather than going to one large distributor and buying it all in one place.....oooh how tempting that is ! 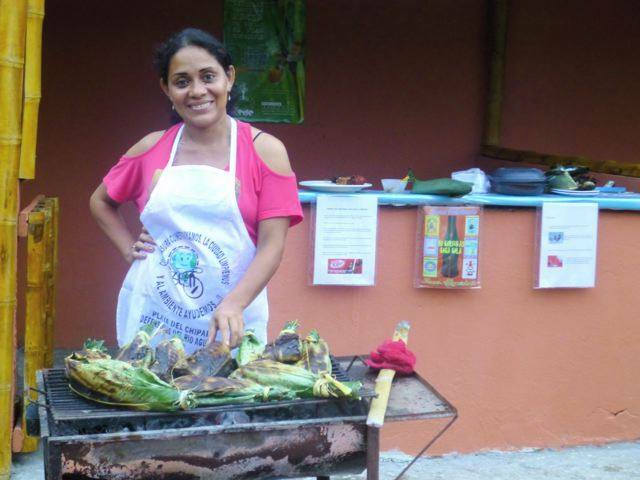 Asides from the 23 rainwater systems I also completed and opened the first ecological restaurant in the Ecuadorian Amazon. 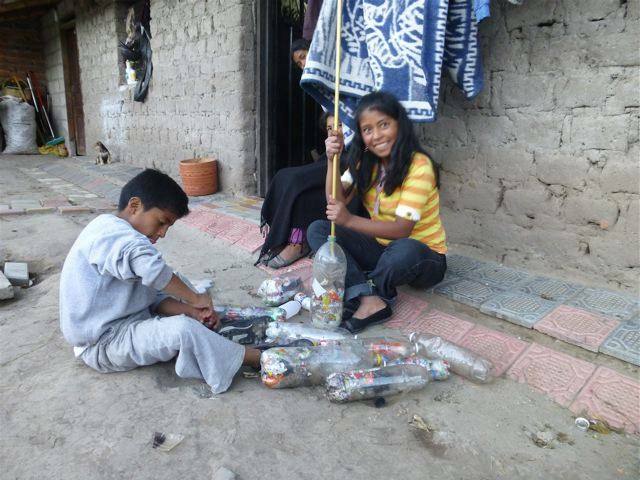 The year previous I had worked with numerous schools and colleges to clean the river and village and make eco-bricks. The restaurant and surrounding garden walls contain 3,200 plastic bottles filled with rubbish. Not only in the construction of the building but in the way of operating it is totally different to anything in the area. We are the first restaurant to serve local coffee. Although the standard crops of the region are coffee and cacao (chocolate) there is nowhere to buy it, it is all exported. The only coffee available is Nescafe and the only chocolate Nestle. 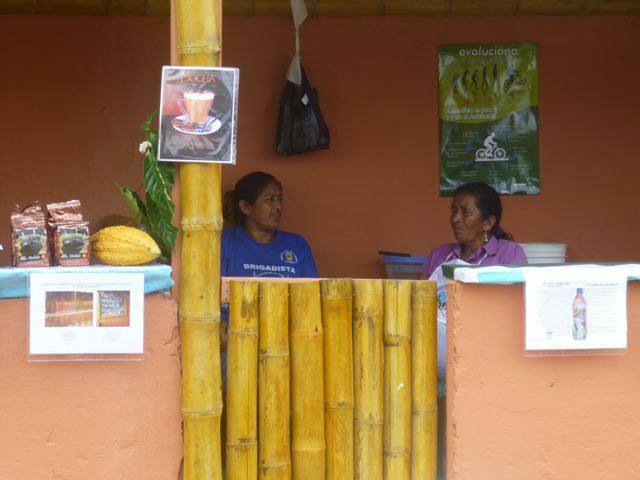 Our 'Comedor Ecologico' serves the now famous....'mocha' never heard of before , but in fact the true taste of the Amazon. I was interviewed on numerous radio stations and tv channels about the restaurant and what was mocha??? Mayors from other regions came to ask if I would do the same in their towns. It was a great opportunity to speak publicly about the issue of rubbish, supporting local food and farmers and boycotting the two companies who seem to have total control over Ecuador: Coca Cola and Nestle, neither of whose products are used in the restaurant. The other great difference is the avoidance of all kinds of disposable packaging. It is normal in Ecuador for food vendors to use polystyrene disposable plates. We only use banana leaves. Everything else is washable and consumed in the restaurant. There are 10 woman who are a part of the collective and it has taken many community work days to arrive at this point. Colleges, unions and the police have all come along on work days. 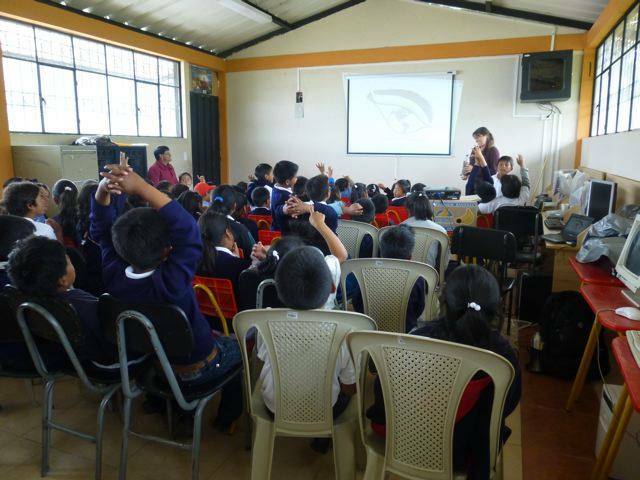 Often we had over 50 people, one day 75 students came to help. The restaurant also acts as in Information Centre where there are photos and information about rubbish, where it goes and what it does. There is also an explanation as to why Nestle and Coca Cola are not served. In addition, there is information on how to build with eco-bricks. The project was supported by the local council who provided the roof, sand, cement and 1,800 bricks for the patio. 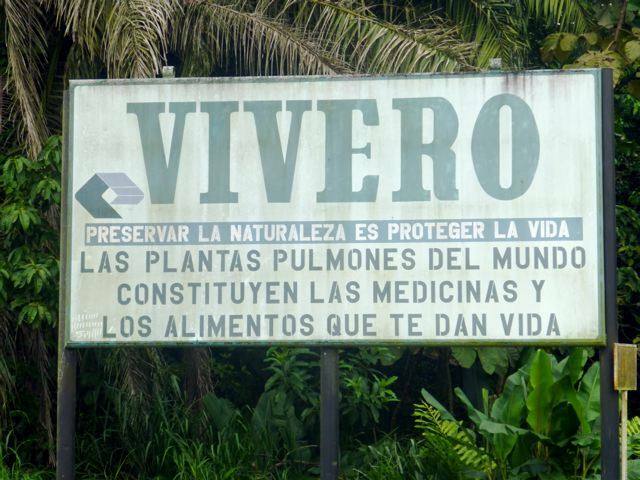 PetroEcuador (the National Oil company) which has the only plant nursery around donated 200 plants for a garden . Local radio stations advertised the opening for free and even the region's mayor was greatly supportive of the project. Between Christmas and New Year I went to visit some indigenous friends in the mountains of Ibarra as they were interested in learning about the eco-bricks. A stunning little village at the base of the volcano Imbaburra called Esperanza (Hope). Unfortunately it is one of the worst areas for rubbish as there is little collection. I spoke in the three small schools about what happens to the rubbish and why we have to all start to work together. With a bicycle for the prize all the children of the village enthusiastically were out filling bottles with rubbish. From these they decided to build a mud/bottle bench for the bus stop. The local council was so impressed they now want to build 72 more benches. It really was so fantastic to see the village clean by the time I left. My friend has since attached empty bottles around the village with messages saying "I am a rubbish bin, please fill me up" and the project is working. I returned the weekend before I left and was happy to see very little rubbish around the village. Its true from small seeds and the sharing of ideas together we can all make a huge difference in the world in which we live. 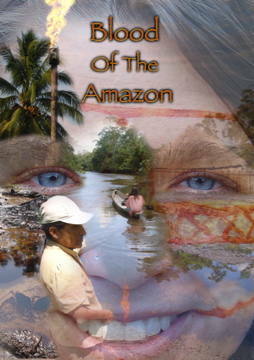 My film Blood of the Amazon which gives the people a voice and tells of my journey down the Amazon investigating the effects of the oil industry has been translated into Spanish. It has been widely distributed and even the long distance bus companies asked for copies. I was able to give out 200 additional copies to each of the affected communities, indigenous leaders, TV stations and to the lawyers of Chevron Texaco when they came to town. I was also asked to speak on the main regional radio station about Genetically Modified Seeds, the importance of organic agriculture and compost toilets. The village in which I built the seven rainwater systems and a local tourist lodge are now building compost toilets from eco-bricks. I love this sign I found inside the oil industry grounds. (To preserve nature is to protect life. Plants are the lungs of the world, they make up the medicine and food that give you life) Seems like they have not connected the dots! Before leaving I initiated a meeting with PetroEcuador. They are interested in me coordinating a group of scientists specialising in Mycoremediation (the use of mushrooms to clean up oil spills) to visit the region. I have urged them to build bio-filtration systems where the overflow pipes are. There are over 1,000 pits (left behind by Texaco) which after heavy rain overflow into the nearest stream. This contaminated water contains crude oil, heavy metals and at times even radioactive substances. PetroEcuador told me they had never thought of putting filtration systems in place although they are wanting to clean up the pits. This is a long term plan and we need to act now and put in place a short term solution to prevent the continual unnecessary contamination. In conclusion it was a mission successful, 23 families are now drinking clean water and more people than I could have imagined were involved in the eco-brick projects. Meetings with PetroEcuador and The Department of the Environment in both Costa Rica and Ecuador seemed a positive push in the right direction. I now look forward to a number of presentations around England and wish to inspire others to be the change we wish to see in the world. 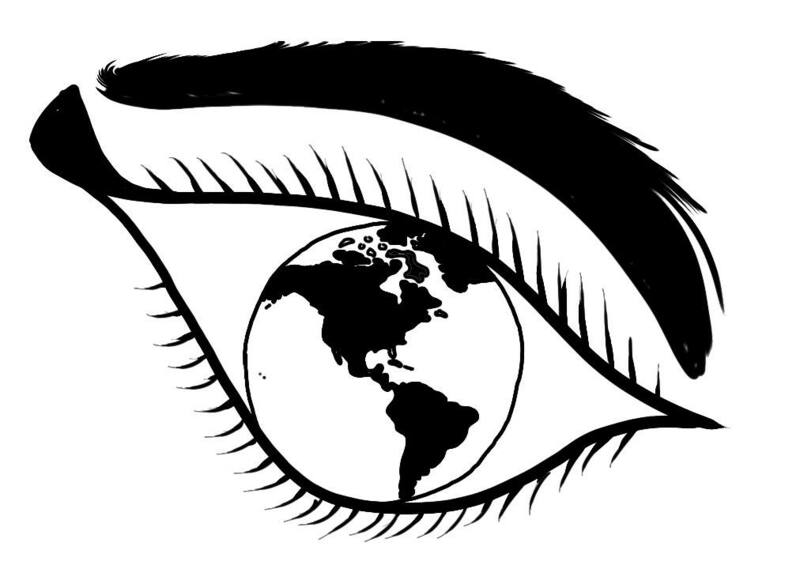 Following are a few pages of photos so just click on the bottom and it will take you on a visual trip.